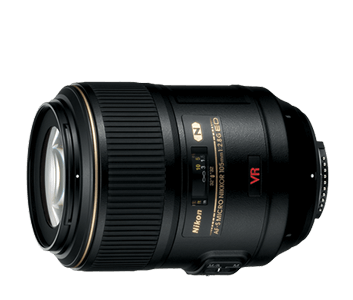 The AF-S VR Micro-Nikkor 105mm f/2.8G IF-ED is an outstanding medium focal length macro lens that excels at a host of photographic styles. With its sophisticated optics, f/2.8 maximum aperture and 1:1 reproduction ratio, this lens produces impressive macros, breathtaking portraits and more. Its Vibration Reduction image stabilisation reduces camera shake for crisp photos and HD videos when shooting handheld or in low lighting. Our Silent Wave Motor (SWM) technology ensures fast, smooth and unobtrusive auto-focussing for impeccable images shot after shot. The lens’ 105mm fixed focal length offers a broad range of shooting possibilities. Its 1:1 reproduction ratio allows the lens to capture subjects at their actual size, resulting in true to life macro shots. Shoot close-ups while keeping your distance – perfect for photographing flowers, insects or small wildlife. In addition to its excellent macro capabilities, the lens delivers excellent image quality from medium distances to infinity, resulting in superb landscapes or portraits with a smooth background. This lens features innovations that make every shot truly spectacular. Its wide f/2.8 maximum aperture produces excellent bokeh that isolates your subject with stunning results. Extra-low Dispersion glass and Nano Crystal Coat eliminate ghosting, flare and chromatic aberrations to deliver superior images in any lighting. Vibration Reduction (VR) image stabilisation improves image stability and delivers a performance boost of up to 3.0 stops*, making it ideal for shooting handheld or in low-light environment, while the fast and quiet Silent Wave Motor (SWM) achieves impeccable focus. The innovative SWM and the VR mechanisms incorporate a multi-group focusing, rear-group split configuration, which reduces weight and keeps the lens length fixed during operation. Folllow featured professional photographer Scott A. Woodward and photography enthusiast Chantal Windley as they use the AF-S VR Micro-Nikkor 105mm f/2.8G IF-ED to capture the making of traditional boots. *Based on CIPA Standard. The value is achieved when: DX-format lenses are attached to a DX-format digital SLR camera, FX-format compatible lenses are attached to an FX-format digital SLR.